The weather didnâ€™t co-operate, but the annual Spring into Tawa market day went ahead anyway. 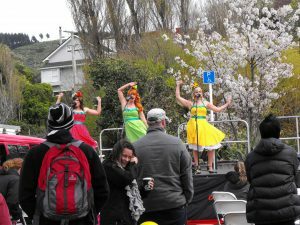 Tawaâ€™s annual market day, Spring into Tawa, was held yesterday. The organisers, Vibrant Tawa (the Tawa Ratepayersâ€™ and Progressive Association), had decided to hold it later than previously, and increase the number of places available for stallholders. To accommodate the bigger market, Main Road was closed between Essex Street and Cambridge Street. 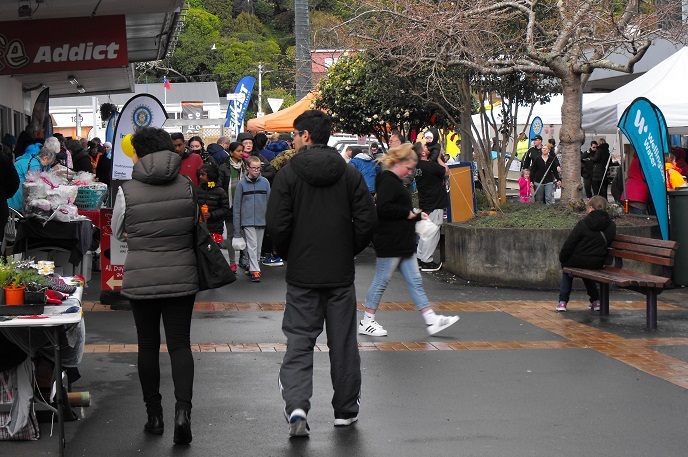 A few of the 115 stallholders chose not to set up when Saturday dawned with a cold southerly and steady rain. However, the majority who persevered were able to enjoy the patronage of the crowds who ignored the occasional squalls as the weather slowly improved. Some stalls were moved from the centre of the road to the cover of Main Roadâ€™s verandahs. The stage set up in front of Take Note hosted a number of performers from local dance groups to school musicians. 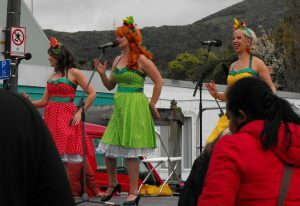 Star of the show was female trio AviDiva. Stalls covered the full spectrum from food to gardening, homewares, second-hand goods and bric-a-brac. In keeping with the season, plants raised by local horticulturalists and school students proved very popular. The local alpacas enjoyed themselves. The Tawa Historical Society had a surprising number of local publications for sale. Light industry took the opportunity to display the products that they make locally. Tawa ITM had garden furniture, planters, compost bins and trellising â€“ all assembled on their premises. Local entrepreneur Embrace Design offered a number of its digitally fabricated products. This Tawa start-up offers CNC wood, aluminium and soft metals milling, laser cutting and 3D printing services as well. Tawaâ€™s heavy industry was conspicuously absent. Closing a section of road allowed food trucks to join the market and all did good trade, with several selling out of their popular offerings. The doughnut, Thai, Malysian and Indonesian trucks proved very popular. The small beef rending burger with caramelised onion from One Bite Indonesian Food Truck was delicious. 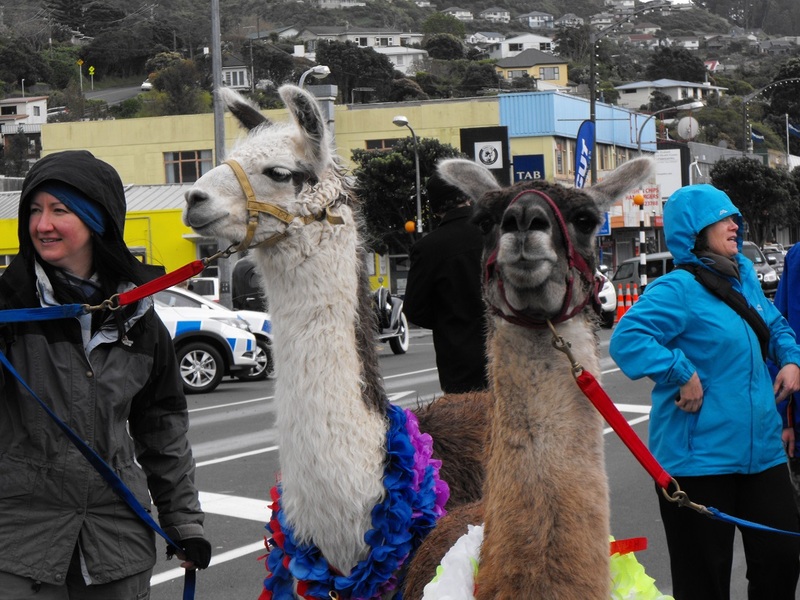 Opinion seems divided as to whether this yearâ€™s event attracted more people than last yearâ€™s. Perhaps having a significant section of roadway available made the crowd seem thinner â€“ no doubt we will soon know. Despite the weather, we had an enjoyable day out, picked up good quality vegetable plants for the garden and were glad we sampled the wide range of food provided by the trucks. Surprisingly only a few of the local food outlets participated by opening an outside stall. Those who did (Curry Zaika, Nada Bakery and Tawa Village Bakery) gave locals the chance to sample snack versions of their usual offerings which should pay off in continued patronage. 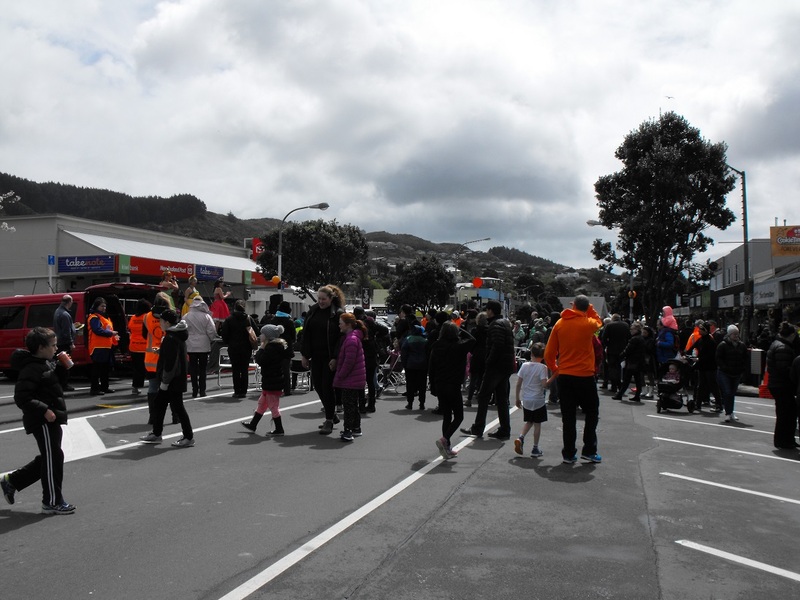 Well done Vibrant Tawa and all who participated and supported! 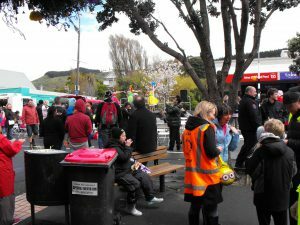 Spring into Tawa 2016 was a success, despite the weather. This entry was posted on Sunday, October 16th, 2016 at 2:49 pm and is filed under Local News. You can follow any responses to this entry through the RSS 2.0 feed. You can skip to the end and leave a response. Pinging is currently not allowed.